Masked Man And The Agents - Back By Popular Demand! Jim Dickinson is the demented genius playing piano on Teenage Head by the Flamin' Groovies, Wild Horses the Rolling Stones, My Babe by the Jesters, aka, the last great record on Sun, as well as Spirit In The Dark by Aretha Franklin. He also produced Big Star's Third and Mudhoney's Tomorrow Hit Today. Just to name a few. The Reigning Sound have a brand new album out today on In The Red Records! It features our own DA the DJ on organ. " Love And Curses" is a nod to Memphis Horror Host extraordinaire, Sivad. Check out a long interview with singer/songwriter, Greg O here on the always entertaining Turn It Down blog. The Minneapolis surf kings, The Trashmen will be playing NY for the first time ever on October 23ed at Southpaw in Brooklyn. And at Maxwell's in Hoboken, NJ on October 24th. Get your tickets now!!! This is the same weekend as the WFMU Record Fair. In the meantime, enjoy this 1964 performance from Bandstand. More songs after the jump! Roy Orbison - Go! Go! Go! Frankie Lee Sims - What Will Lucy Do? Chuck Willis - What Am I Livin' For? Thanks To Listener Greg G for sending this one in! 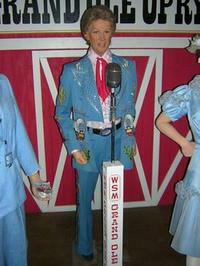 The Proprietress of WFMU's Radio Thrift Shop made her debut at the Grand Ole Opry this week! She will also be paying tribute to the Queen of Country music, Mrs. Kitty Wells, today at the Country Music Hall Of Fame. This post courtesy of Listener Thomas G.
The Mummies are playing Maxwell's on June 9th. My pal, Chris Reilly was recently laid off at 1010 WINS. You've probably heard him late at night while you were riding around drunk in a cab. Here he is with the great Henry Lewis on a recent Saturday night at WNYC. 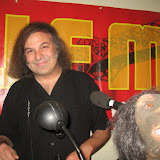 Take a listen to his Master Reel Here (mp3) then give this man a job! Dream bill 2009. 2 shows. Memphis and Detroit. 2 weeks in Europe, but who can afford that? Watch the Goner Records message board for dates. My money's on the Oblivians. When you're looking at listener Greg G, you're lookin' at Country. Grab a six pack and tune in this Thursday evening when he drops by our Jersey City studios with more whacked out country 45's than you can shake a stick at. Here are some of my favorites from the long lamented mix tape days. Music To Spazz By was all the way live this past Thursday evening at the Tip Top Bar & Grill in Brooklyn . Thanks to everyone that came out!! Click on DA the DJ for a slideshow and hear the whole mess in the October 16th archive. Photos courtesy of DJ Michael Shelley and Lisa Hamilton, aka "The Momager" of Beastin' The Airwaves with Keili. Put A Head On A Stick And Have A Party! Ghoul A-Go-Go is the world's only Monster Musical Kiddie Show and we've got 'em in the A/V Lounge! Join us Saturday October 25th at the WFMU record fair for a live dance party with Vlad and Creighton. The fun begins at 1 PM on Fool's Paradise with Rex. Then, stick around for a viewing of the very latest episode, Tikis!! Check the Ghoul's broadcast schedule right over here for a bat channel near you. For those of us that can't wait, here's episode # 14: JAPAN, featuring the 5.6.7.8's!